Julian's CD and book of sheet music, "Seize The Day", is now available. Julian is a pianist/keyboardist in the vicinity of Vancouver, British Columbia, and found his passion for music at an early age. His piano style combines elements of pop, jazz, hip-hop, funk, latin, blues, gospel and folk - and results in a fresh approach to music new and old. His secondary instruments include voice, guitar, percussion and organ. 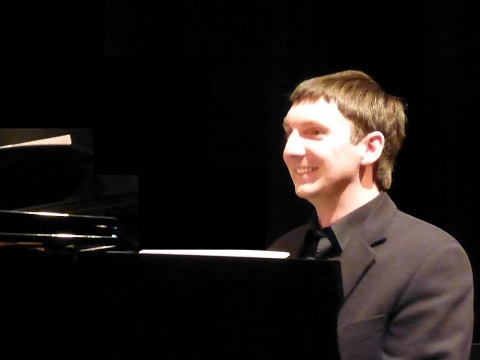 Julian holds a Bachelor of Music in Jazz Studies from Capilano University, a Grade 10 Piano Diploma from the Royal Conservatory of Music, and a Master's in Business Administration from Royal Roads University. He leads music at Mount Seymour United Church and can also be found playing with the Higher Ground Women's Ensemble, Simply Twisted, emulating Oscar Peterson and Billy Joel at local cocktail receptions and weddings, and accompanying choirs in his community. Are you having a party? Wedding ceremony? Contact Julian for more information! Within the past twenty years, Julian has emerged as a resource person to congregations and special events within the United Church of Canada. During that time, he has been involved both as a music leader and as a consultant for local, regional and national events; he has worked with musicians such as George (Geordie) Roberts, Janet Warren, Bryn Nixon, Linnea Good, Brian Tate, Bruce Harding, Christopher Giffen, Josh McHan, Gord Oaks, and Ron Klusmeier. Julian's compositions are quickly making their way across Canada, and several of these tunes have been included in the Seasons of the Spirit curriculum as well as More Voices, the supplement to the United Church hymnary. He is a manager with the Greater Vancouver YMCA and continues to be a popular choice for on-call music opportunities within BC and beyond.